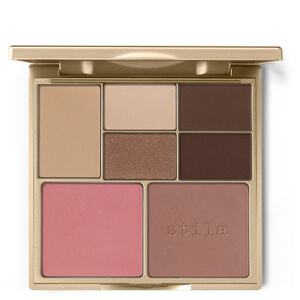 A chic, easy to use palette filled with neutral hues that are just perfect…for you! Long-wearing, one swipe eye and cheek colors expertly curated to work with your skin tone to create the perfect neutral look. Choose from four distinct palettes that house five eyeshadows and two blushes in matte, shimmer and pearl finishes; customizable to create the look or looks you want. Eye shadows may be used wet or dry. 78% pigment saturation offers incredibly vivid, long-lasting color. Triple milled powders and mica allow for exceptionally smooth application with no need for a primer. For a natural look, sweep Breathtaking lightly all over lid. Apply Passionate to create a smoky effect. Use Dynamic as your crease and contour shade. Press Glamorous into the upper and lower lash line and smudge. Apply Romantic or Playful to the apples of the cheeks, blending upward. Fair/Light Palette Ingredients: Eye Shadow - Mica, Zinc Stearate, Lauroyl Lysine, Caprylic/Capric Triglyceride, Dimethicone, Polymethylsilsesquioxane, Caprylyl Glycol, Phenoxyethanol, Isopentyldiol. (+/-) Titanium Dioxide (Cl 77891), Iron Oxides (Cl 77491, Cl 77492, Cl 77499), Carmine (Cl 75470), Yellow 5 Lake (Cl 19140), Manganese Violet (Cl 77742), Ultramarines (Cl 77007). Blush: Mica, Zinc Stearate, Lauroyl Lysine, Caprylic/Capric Triglyceride, Dimethicone, Polymethylsilsesquioxane, Caprylyl Glycol, Phenoxyethanol, Isopentyldiol. (+/-) Titanium Dioxide (Cl 77891), Iron Oxides (Cl 77491, Cl 77492, Cl 77499), Carmine (Cl 75470), Yellow 5 Lake (Cl 19140), Manganese Violet (Cl 77742), Ultramarines (Cl 77007), Red 30 Lake (Cl 73360). Contains Carmine As A Color Additive. The first Stila product I've ever try. The pink tone is great for spring!